Anyone can be a victim of a bogus caller or rogue trader – so don’t let your doorstep be their marketplace. 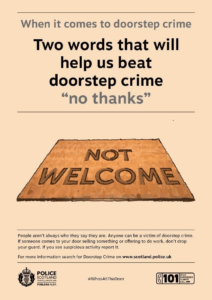 That’s the message to every single homeowner and tenant in Scotland, as Police Scotland launch a two week campaign to raise awareness under Operation Monarda. Between April and September 2017, 336 victims of doorstep crime were defrauded out of around £420,000. While most victims were considered vulnerable in some way (54%), or were of pensionable age (79%), a significant proportion were outwith these groups which are traditionally targeted by such offenders. During the campaign, which is running between 21st May and 3rd June, officers across Scotland will be running events and stalls to speak to the public at key locations such as banks, garden centres and supermarkets, as well as events giving advice to partner organisations and their clients such as care providers, groups that support those with dementia, and Citizens Advice Scotland. Operational work such as victim visits and warrants will be carried out during this period, and a series of videos will be running on social media with victims telling their real-life stories. We are carrying out a wide range of activities in order to reach as many people as possible, because bogus callers and rogue traders are indiscriminate. They will call at any house they can, looking to con the occupant and line their own pockets. The more vulnerable in our society do continue to be the main target for these fraudsters and I would urge people to please look out for their elderly or otherwise vulnerable friends, relatives and neighbours – but please also spare a thought for yourself. These criminals can be very plausible and persuasive and it can be easy to be taken in by them. There are simple steps you can take when a cold caller arrives at your door, such as using a door chain so as not to let them into your home, or checking their identity by independent means – but if you are concerned, please do not feel embarrassed to report this to police as it’s only by receiving these reports that we can build a picture of the fraudulent activity and take action. Call 999 if you feel scared or intimidated. Please be alert as these opportunists are making a living from defrauding the public and constantly move from place to place to carry out their con – bogus callers and rogue traders will unfortunately be found on a street near you but together we can bring down their criminal enterprise and keep our communities safe. Citizens Advice Scotland is delighted to once again back this campaign. With our network of 60 CABs across Scotland and our specialist consumer helpline, we are well-placed to play a key part in the fight against scams. Our advisers regularly hear from people who have been victims of all types of scam, and doorstep crime can be one of the most distressing. Our message today is that people should be vigilant in spotting scams and should feel empowered to report any doorstep scams they experience or hear about. As ever, the CAB service is here to help. 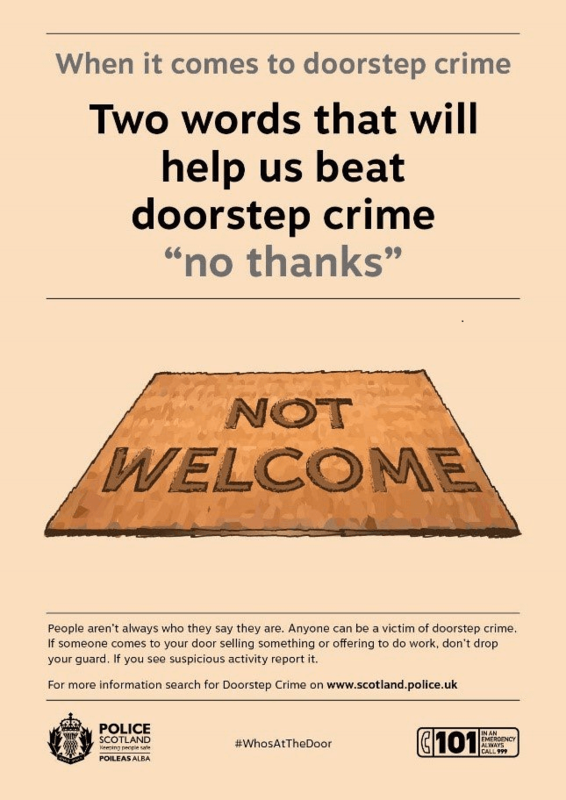 If you see any door to door callers who seem to be suspicious you should report it to Police Scotland on 101 or if you if you feel scared or intimidated call 999.